Designed for commercial use, this microwave oven from Royal Sovereign is ideal for light to medium use in quick service snack bars, supermarkets, office cafeterias, and more. Offering convenient features like multi-stage cooking, three power levels, and a touch keypad with 10 programmable settings, this stainless steel model is sure to impress! This Café Over-The-Range Microwave Oven fits perfectly within the space of your range hood and comes equipped with a ventilation and lighting system for the range below. Special features include smart electronic controls with 10 power levels that help in accurately cooking any meal - from frozen entrees to refrigerated casserole dishes. Plus, the easy-to-read, horizontal scrolling display makes cooking easier and gives you the flexibility of programming several functions at once. Stylish and efficient cooking are easy to achieve with this remarkable mid-sized microwave oven by Danby. This model offers a generous 1.1 cubic feet (31.15 litres) of interior cooking and heating area with a maximum power output of 1000 watts. It features a fashionable and durable stainless-steel interior and exterior which allows it to easily assimilate with any type of existing dicor. The unit comes with numerous cooking options as it offers 10 different power levels to choose from. There are six separate one-touch cooking settings for popular foods such as frozen dinners, popcorn, and pizza as well as speed-defrost, cook-by-weight, and defrost-by-weight specialty programs. The state-of-the-art electronic controls are a breeze to program and monitor via the easy-to-read LED timer and clock unit. This high-quality microwave oven also comes with an 18-month warranty on parts and labour. Cooking creative dishes is fun and easy with this top-of-the-line microwave oven by Danby. This unit features 0.7 cubic feet (20 litres) of cooking and reheating space and can pump out a maximum of 700 watts of power. It's stylish stainless-steel exterior means it will easily integrate with any type of existing decor and add a touch of elegance to any setting. The appliance offers 10 different levels of cooking power and boasts simple one-touch programming for half a dozen of the most popular microwave oven uses. The state-of-the-art electronic controls can be programmed quickly and easily and can be monitored by the easy-to-read LED timer and clock unit. This economical countertop model is ideal for any type of household as well as offices, cottages and dorm rooms. It also comes with a worry-free 18-month warranty on parts and labour. Danby's countertop microwaves are not only practical and economical, they're stylish too! Great for dorm rooms, offices, cottages and home kitchens, this compact capacity unit offers all the power necessary to heat your favourite food items, without inconveniently taking tons of counter space. 0.9 cu. 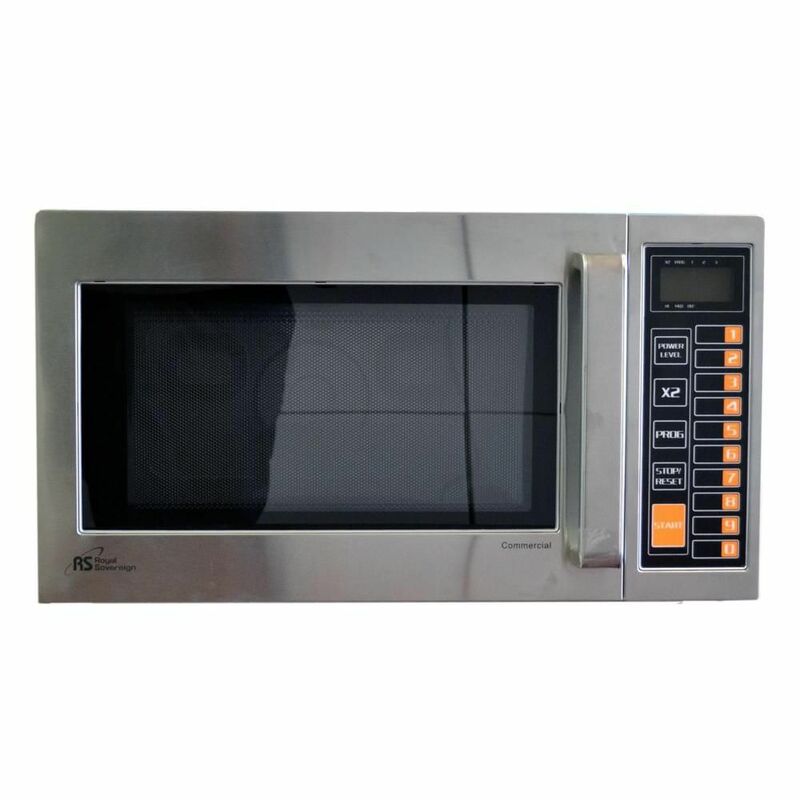 ft. Commercial Microwave Oven in Stainless Steel Designed for commercial use, this microwave oven from Royal Sovereign is ideal for light to medium use in quick service snack bars, supermarkets, office cafeterias, and more. Offering convenient features like multi-stage cooking, three power levels, and a touch keypad with 10 programmable settings, this stainless steel model is sure to impress! 0.9 cu. ft. Commercial Microwave Oven in Stainless Steel is rated 5.0 out of 5 by 2. Rated 5 out of 5 by Beckster from I purchased this for our office which has about 40 people. We have been using it for about a mon... I purchased this for our office which has about 40 people. We have been using it for about a month now and I haven't heard any negative comments thus far. It is easy to use, programmable buttons are a plus. Just the right size.